Setting the Context for Change Academy: What is it and who is involved? Staff and student members from the University of Kent have been participating in a Change Academy initiative within Social Sciences. What is Change Academy? 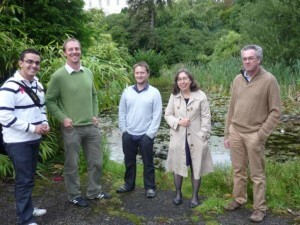 Residential Team (left to right): Tom Ritchie, Simon Black, Bill Collier, Helen Carr, Stephen Burke. Not shown: Gill Sinclair, Cindy Vallance. Change Academy is a partnership between the Higher Education Academy and the Leadership Foundation for Higher Education. This year, ten HE institutions took part in a residential programme to help teams of staff and students develop their knowledge, capacity and enthusiasm for achieving complex institutional change to benefit the student learning experience. A key event of the Change Academy programme was the four-day residential experience in September 2011 which launched the initiative and was designed to encourage our team and others to focus attention on our projects, encourage creativity, and develop and practice a range of techniques to build momentum for change following our return to Kent. The original residential team has been thrilled to see the interest that others have shown for the initiative and the group has already nearly doubled in size since returning from the residential event with the addition of Alison Dean, Naomi Dumbrell, Chloé Gallien, Mick Norman, Leo Wilkinson. The current group of 12 reflects a diverse range of roles. Just consider our job titles (and yes some of them are rather lengthy): Soc Sc Faculty Learning Technologist; Economics Lecturer and Director of Studies Stage 1; Soc Sc Faculty Administration Manager; Master of Eliot College and KBS Senior Tutor, Project and Finance Manager; Learning and Development Adviser; Timetabling Office Learning and Teaching Space Manager; Kent Union President; Head of Organisational Development; KBS Senior Lecturer and Soc Sc Sub-Dean for Learning and Teaching; Soc Sc Student Representative, Learning and Development Coordinator; KLS Reader and Director of Learning and Teaching. Why is Change Academy of interest to such a wide range of already very busy people?